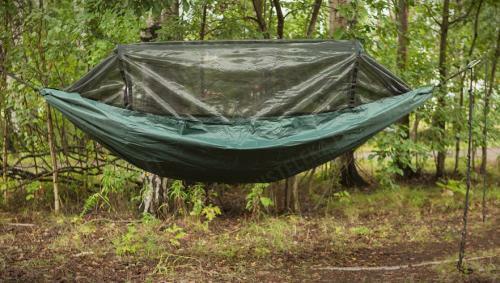 The Travel Hammock is the waterproof model of DD Hammocks mosquito-netted hammock family. Other than the waterproof base the Travol is basically the same as the non-waterproof Frontline Hammock. The waterproof construction makes it possible to use the Travel Hammock as a waterproof bivvy for your sleeping bag when sleeping on the ground! Double fabric - you can slip a sleeping mat inside for insulation from the cold. 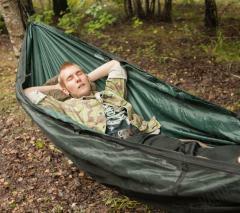 Waterproof material - the Travel Hammock can be used as a bivvy bag for sleeping on the wet ground or in the rain! This however also makes it less breathable than the non-waterproof hammocks, which can be a downside in hot climates. Very fine insect net, no known bloodsucker will go through the tiny holes. Comes with poles to keep it further away from the sleeper, but these are optional. 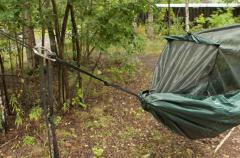 If the net is not needed, the hammock can just be flipped over so the net remains on the bottom. However, the net can be kept open too and pitching it is just a matter of tying two ropes. A few pockets for valuables you don't want to leave lying around the ground. Comes with 2 meter long webbing ropes attached, these can either be tied directly around the tree trunk or used to make loops for an adjustable attachment system in combination with climbing carabiners and a lenght of Paracord to make the round-the-tree loop slings. Waterproof packsack. Designed for field use, not for factory packaging, which means there's room to just stuff the hammock in. The manufacturer states these are good for up to 125 kg / 2 m people. Measurements 2,7 x 1,4 m.
The ropes are 2 m long each, not taking in account the Tree Huggers. Weight for the whole set 1,17 kg. Packs to about 27 x 17 cm.